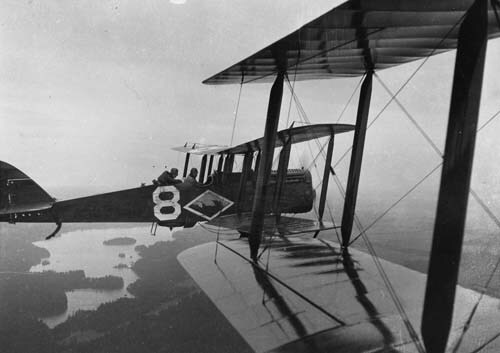 On this date in 1915, what is believed to be the world’s first forest patrol flight was made at Trout Lake, Wisconsin. 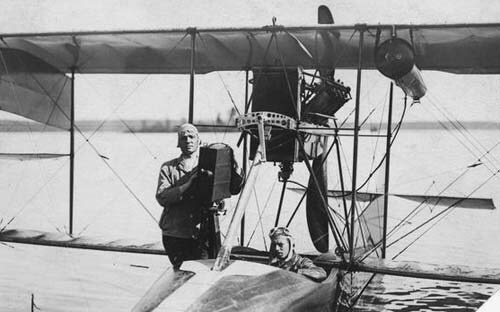 Aviation pioneer and wealthy Chicago sportsman Logan “Jack” Vilas made the initial flight in order to demonstrate the viability of using aircraft in fire prevention. 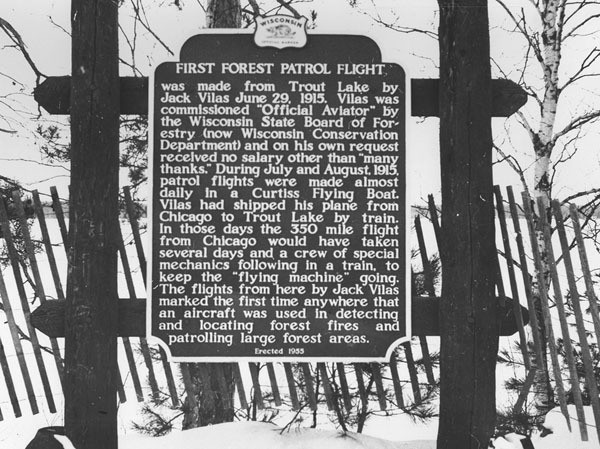 Wisconsin’s Chief Forester Edward Griffith hired him but Vilas refused pay, saying that he wanted only a salary of “many thanks.” Vilas flew almost daily in July and August as a flying fire warden over the forests of Wisconsin. His 1929 memoir, My Life To My Children, tells this story and many other adventures of this colorful character. It had fallen out of copyright before Mary J. Schueller edited and self-published it in 2007. In 1913, at around age 32, Vilas decided he wanted to become a pilot. Till then he had been a racing car enthusiast. He set his sights on a flying boat and traveled from the Midwest to Hammondsport, New York, to see Glenn Curtiss and purchase a plane for $7,000 ($157,000 in today’s money). While waiting for it to be built, he took flying lessons at Curtiss’s flight school and earned Hydroplane Pilot License No. 6 from the American Aero Society. He had his plane shipped to Chicago by rail. Six weeks later, and with only a few hours of flight time under his belt, he became the first person to attempt and complete a 63-mile flight across Lake Michigan. He did so with no compass or flight instruments. 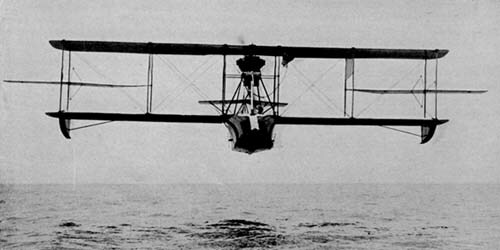 In 1915 Vilas shipped his flying boat to northern Wisconsin, where he had a summer home, to conduct an experiment. On June 29, 1915, he “took Chief Forester Edward Griffith for a ride to demonstrate how easy it was to spot forest fires by air.” Impressed, Griffith had the Wisconsin Conservation Commission appoint Vilas as a flying fire warden, the first in the world. Vilas flew his surveillance missions from the forestry headquarters at Trout Lake in Boulder Junction. (A historical marker was placed at that spot in 1955.) News of Vilas’s work quickly spread; American Forestry magazine had an article about it in their September 1915 issue. The use of aerial detection to spot and report forest fires—dubbed the “Wisconsin Plan”—soon became a vital tool in fighting wildfires in many forested countries. By 1917, the Wisconsin Plan had been adopted throughout the United States and was beginning to spread around the globe. 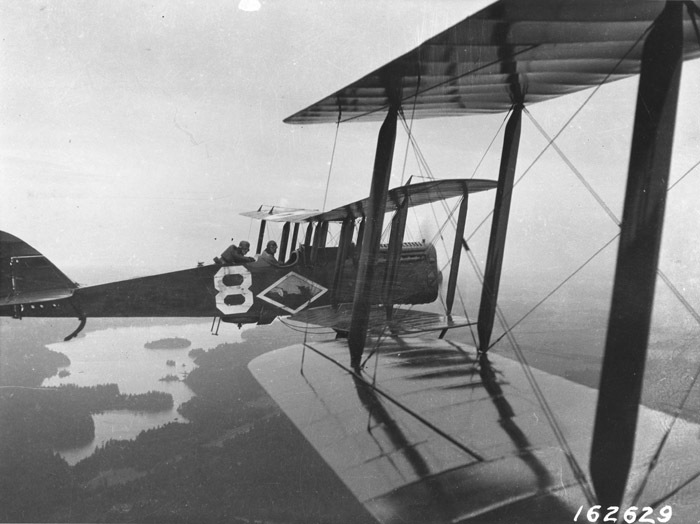 The U.S. Forest Service joined with the Army Air Service in 1919 to introduce aerial fire patrols over national forests. The first missions were in California. According to Radio for the Fireline, the rumor that each plane was equipped with a telescope and machine gun proved a powerful deterrant to arson—the number of fires on the Cleveland National Forest decreased for awhile (p. 15). But personnel shortages compounded by shrinking War Department budgets cast doubt over the Air Service’s involvement at the beginning of each of the next six fire seasons. Among some foresters, reviews of the tool were mixed. Not as many fires were first spotted by the air patrols as hoped, and the lack of wireless radios for communication between pilot and ground crew slowed the fire reporting process down significantly. And yet after one season the Forest Service declared it a “huge success” (Radio, p. 16). So break out your silk scarves and goggles to celebrate those daring young men in their flying machines. Watch as they take wing over our national forests in this photo gallery. For you armchair travelers, you can read about Wisconsin’s historical marker effort in our old journal here.